May 14, 2015 – The positions of the planets next month will mean diminished communications between Earth and NASA’s spacecraft at Mars. 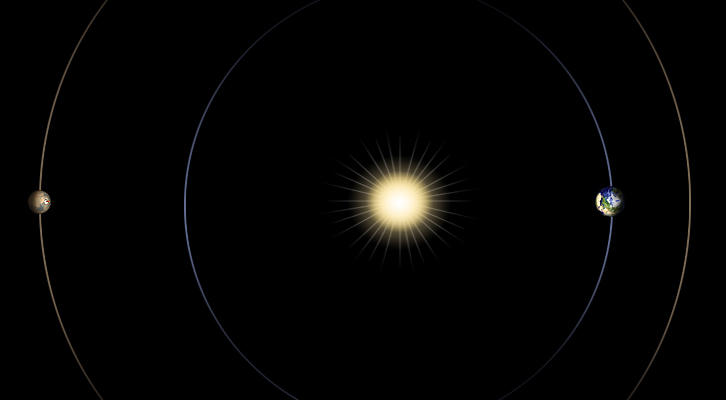 Mars will be passing almost directly behind the sun, from Earth’s perspective. The sun can easily disrupt radio transmissions between the two planets during that near-alignment. To prevent an impaired command from reaching an orbiter or rover, mission controllers at NASA’s Jet Propulsion Laboratory (JPL), Pasadena, California, are preparing to suspend sending any commands to spacecraft at Mars for a few weeks in June. Transmissions from Mars to Earth will also be reduced. The travels of Earth and Mars around the sun set up this arrangement, called a Mars solar conjunction, about once every 26 months. This year’s Mars solar conjunction will take place from June 3 to 25. No one attempts to send new instructions to Mars during a solar conjunction. It’s impossible to predict what information might be lost due to interference from charged particles from the Sun, and that lost information could potentially endanger the spacecraft. Instead, engineers send two weeks’ worth of instructions to each spacecraft prior to solar conjunction and then leave the spacecraft on “auto pilot.” While that may seem risky, engineers have become skilled at letting spacecraft be on their own. Mars orbiters and rovers continue science observations on a reduced basis during conjunction. Some instruments are turned off, while others collect data and store it for later retrieval. Some spacecraft continue sending data to Earth, knowing that some of it will be lost. Once the Mars solar conjunction is complete, all spacecraft will resume normal operation and MAVEN will begin its next deep-dip campaign beginning July 7. How can you communicate with Mars spacecraft when the Sun is in the way? Learn more about ‘solar conjunction’ in this 60-second video.